Electronic Media (EM) Job Description: Electronic Media is part of the Media Services workgroup within the Daniel J. Evans Library at The Evergreen State College. EM supports audio, video, and media for campus productions while also providing staffing and expertise for instructional media workshops. In addition, EM oversees campus media production facilities, including the CCAM TV studio, audio recording studios, music technology labs, the MultiMedia Lab, and 2D & 3D animation studios. 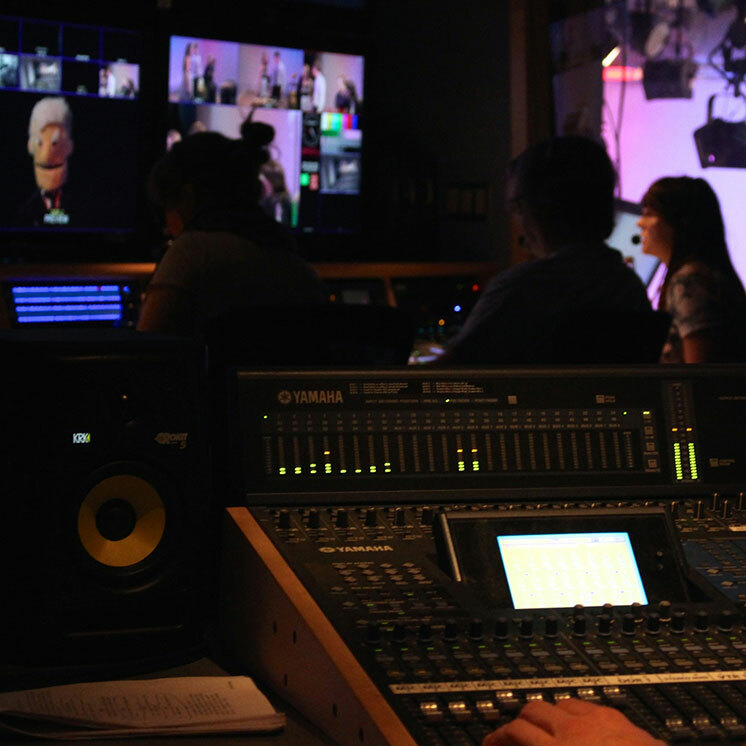 Electronic Media is also heavily involved in both video and audio post-production for campus clients. Already know all this stuff? Apply to work with Electronic Media! Post-production audio and video editing. Qualifications: First and foremost, applicants must have an interest in learning and using media equipment and technologies! Additionally, EM is looking for student employees who capable of team-based and independent work assignments, can problem-solve under pressure, and are able to communicate effectively. EM provides on-the-job training in the operation of our facilities and equipment. Pay increases, when available, are based on additional job responsibilities, or after one academic year of service. Electronic Media is committed to Evergreen's Non-Discrimination Policy, including in the hiring of student workers. Want to develop professional media skills through dynamic and challenging hands-on work? Wish to be a part of a supportive team that "makes things happen" on a regular basis? Need practice becoming a media professional? Check us out! Production Meeting (Mondays, 3-4pm). This is when student workers can sign up for production jobs, workshops, and other work shifts over the upcoming two weeks. Training. Paid training sesssions take place on Wednesdays from 2-3:30pm (with occasional trainings going until 5). Work Study student hours will depend on work study allocation. However, EM does not automatically let employees go when work study is exhausted. Student workers may be required to work a minimum number of hours, including some early mornings, evenings, and/or weekends depending on the needs of productions and academic programs. Reliable transportation and regular, communicative usage of electronic communication tools (email, etc.) are a must. Hiring Timelines: Hiring for the academic year typically begins in mid-summer and lasts through early September. Work study positions are filled first, and then institutional (non-work study) applications are considered as needed. Applications will be accepted throughout the year and will be filled as positions become available. Summer employment is freelance-based, meaning that no regular meetings or trainings take place. Employment is not dependent upon enrollment in summer school, and applicants that have prior work experience are given priority. Apply to work with Electronic Media!